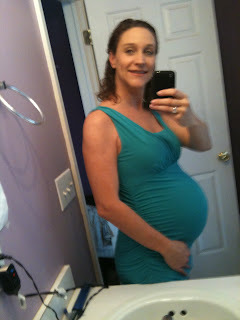 Shelby Family: JuneBug Update, 30 weeks! We have hit 30 weeks with our JuneBug. Today we had an ultra sound, he is growing well and right on track for a June 13th due date. He was not in a great position for pictures today ... but it is always reassuring to see his little legs, arms, spine & heart beat! We are asking for prayers, the placenta is low, in 10 weeks it has moved "some. We will check again in in 6 weeks , if it has not moved, we will schedule a c-section. We would certainly like to avoid a c-section .... so we are praying for the placenta to move and this pregnancy to continue to be uneventful! a shot of how the JuneBug is growing, from the outside! You look amazing!!! Praying for you and your baby!! !